True classics. Those two words immediately come to mind when I look back at these amazing animated shorts, shorts which are nearly 70 years old now. The animation is so fluid and so stunning to behold and, sure, the plots are basically the exact same thing repeated over and over, but these these shorts are just so hypnotic. Fans of animation and comic books often cite the Fleischer brothers’ Superman animated shorts as the gold standard for others to follow, and rightly so. These cartoons have influenced some of the biggest animated series, including an impact that’s still felt on most DC Comics-themed cartoons today. So, let’s dig a little deeper into this latest collection of some of the best animated shorts to hit the big (and small) screen. Make them exciting and visually bold, make them in brilliantly saturated Technicolor: This is a job for Superman! Superman’s adventures in comic books were scarcely three years old when the Academy Award-nominated debut cartoon, Superman burst onto the screen with its breakthrough look and vitality. 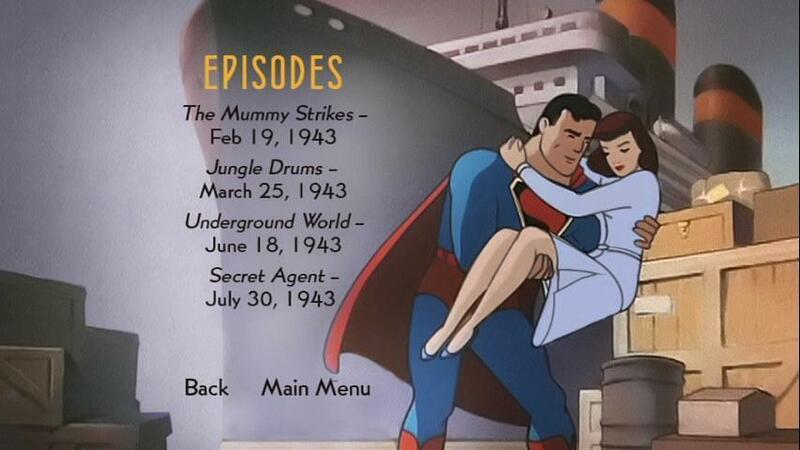 From their signature bullet-paced prologues to their muscular style to their stories steeped in heroics and wartime topicality, these 17 animated theatrical shorts produced by Max Fleischer (with the first nine directed by his brother Dave) set the tone for future screen versions of the Man of Steel’s exploits, inspired animators for decades to come and, best of all, continue to pack a thrilling punch for fans. The excitement still soars! To anyone who hasn’t seen these shorts before, you’re in for a big surprise. Visually brilliant and flat-out stunning, the 17 shorts included in the new Max Fleischer’s Superman DVD release from Warner Home Video is something that every fan should truly have in their collection. We have all been burned by those cheap public domain releases of these cartoons in one form or another, but now you can rest easy picking up this “Authorized Edition” of these classic cartoons. For the sake of those reading this, I’ll be skipping the backstory of these cartoons, especially since a quick Google or Wikipedia search will provide a more detailed and better telling of the history of these cartoons than anything I could ever come up with. I personally feel that I should just jump right into the actual cartoons because, even after watching these cartoons countless times, I still find myself amazed and just stunned by them. Now, I know this won’t be the best review written for these releases, and I’m sure I’ll be far from articulate at times, but, please, just bear with me here. 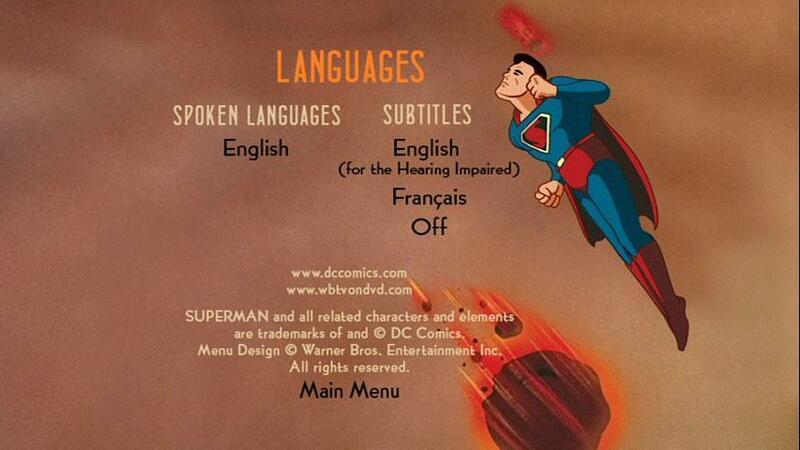 To put it as bluntly as possible, these Superman shorts were straightforward, fast-paced, and heavy on the action. The plot set-up was as basic as can be, but the pay-off was always worth it. Even if every episode followed the exact same basic structure, with a handful of exceptions, it didn’t matter. Watching Superman save Lois over and over again from whatever predicament she found herself in was just glorious and, hey, you have to give the writers credit for managing to jam Lois in danger in nearly every short with out it getting too unbelievable. Too see Superman grapple with a runaway train or a giant robot made it all worthwhile because, boy, do these cartoons ever look gorgeous. Even with the praise in the previous paragraph, I still feel like I’m selling this release short. The use of shadows, the staging, the great design work, all of it. I could seriously gush endlessly about how beautiful these cartoons look, but I’m sure no one wants to read a review that rambles on and on for page after page. These cartoons were staged as if everything happening was real, and it shows. The little flourishes the animators add, like using black lines for some characters and dropping it for others, makes everyone look unique. Couple that with the great art deco design and some really inspired set pieces and you have a cartoon that can’t miss. I know I’m probably repeating myself with this paragraph, but I want to emphasize how groundbreaking these cartoons were for the time and how, even today, this work is still inspiring new creators day after day. These shorts are definitely a product of their time, with Superman fighting a mess of mad scientists and thugs, all armed to the teeth with futuristic technology. Whether it’s robbery, holding the city at ransom, etc., the technology definitely puts up a hefty obstacle for Superman to overcome. And, for the majority, it’s mere fisticuffs to save Metropolis, but some of the latter shorts in this collection the scale is bigger. As one can expect, when the series goes global, especially during the wartime era most of these were produced in, the portrayals of other races and nationalities dive deep into physical and vocal stereotypes. As stated on the back cover to this release, this collection is not intended for children, and it’s abundantly clear why. The second disc contains the wartime produced stories, and the shift in tone is very noticeable and, for some, will likely be very off-putting and even hard to watch. Now, not every short is top-notch. 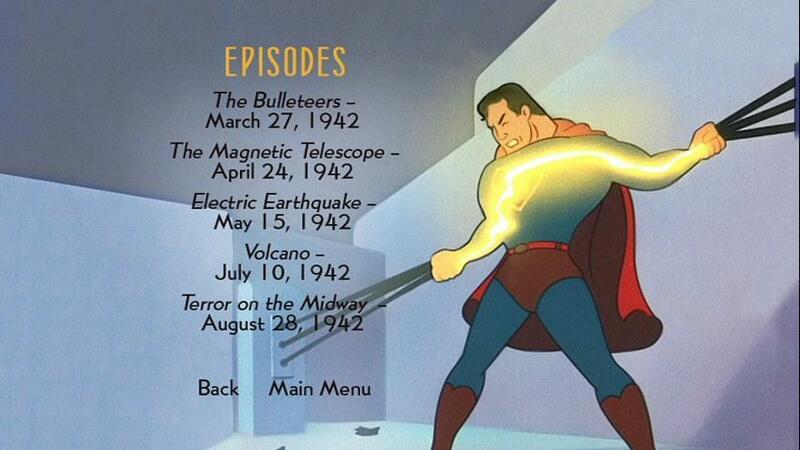 Some of the shorts found on the second disc, from the second batch of Superman shorts, are weaker compared to the shorts found on the first disc. One can rightfully assume that the reported behind-the-scenes problems and budget cuts on the second wave of shorts played a big part in why the eight latter shorts in this collection aren’t held in such high esteem as the initial nine (and, as I said, there are many websites out there that delve into this better than I could). The inclusion of a boy intern, named Louis, is also rightfully the target of dismay toward these latter episodes. Despite all that, the final short “Secret Agent,” featuring Superman helping a secret agent outrun the Nazis, ends the series on a definite high-note. So much more can be said about these cartoons, to be honest, much much more, but let’s wrap this up. As I said, I’m no price when it comes to words, merely a pauper, so I’ll spare you any further meandering diatribe on my part. Whether it’s their historical significance, how they are a product of their time, or their lasting impact on the world of animation and comics, these cartoons remain a critical part in Superman’s history. Besides, they’re also absolutely amazing to look at and art just incredibly fun adventures. While these cartoons may not be the most complex cartoons ever written, they still manage to catch the audience’s attention with their brilliant design work, sophisticated filming techniques, and visually stunning animation. Whether you’re a Superman fan, a fan of animation, a historian, a casual viewer, whatever, these cartoons definitely need to be part of one’s collection. It should come as no surprise, especially to those who have already seen these shorts, that I’m giving the Max Fleischer’s Superman: 1941-1942 collection the Must Own stamp. If ever there was a cartoon collection worth seeking out for both studied or casual animation fans, this one is it! 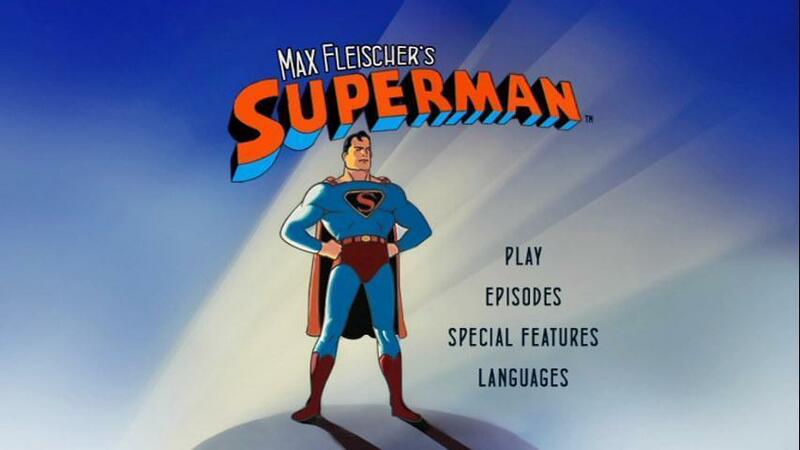 Once again, Warner Home Video has presented the Max Fleischer’s Superman: 1941-1942 collection in top form! The discs are housed inside the standard Amaray case which itself it housed in a sturdy cardboard slipcase. The packaging, exactly the same as the type used for The Zeta Project: Season One is top-notch. Now, as we dig inside, Warner Home Video hasn’t skimped there, either. First and foremost, the audio and video for this release is astonishing. Having seen previous releases of these cartoons, both the cheap releases and the more high-end ones, I can honestly say these are the best presentations of these shorts. While the cartoons still have spots, pops and scratches, that’s to be expected given the age of these cartoons, but they still look just amazing. To be honest, I can’t tell if there’s anything missing or changed from these cartoons, but, to the best of my knowledge, these are the most complete editions of these shorts. The mono audio mix is what can be expected for these cartoon, sounding slightly hollow and somewhat metallic, but, overall, surprisingly solid. There’s no need for any upgraded audio and I’m glad Warner Home Video acknowledged that. So, to sum up, the audio and video are the best I’ve seen for these shorts. And now the extras! 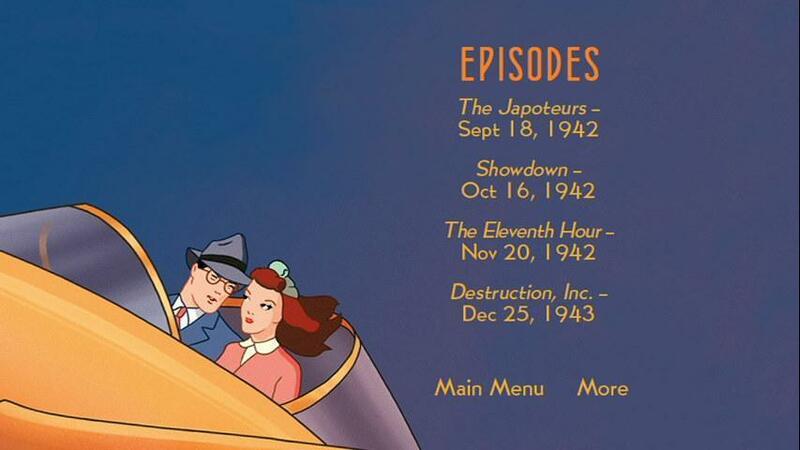 The extras are minimal but, still provide a host amount of information on these cartoons. Both featurettes on the Max Fleischer’s Superman: 1941-1942 cartoons are available on the second disc, covering the historical significance of Superman and these cartoons. The two documentaries, which seem to be carried over from the 2006 Superman: The Ultimate Collection DVD box set release which also featured these classic shorts, really do compliment the main feature. “The Man, The Myth, Superman,” clocking in at nearly 14 minutes, covers stories of similar supermen-type characters in history and why they remain such a crucial part of our culture. 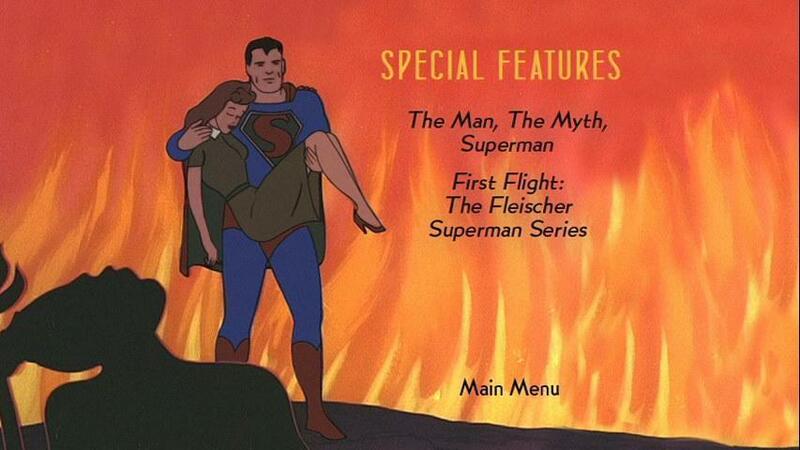 “First Flight: The Fleischer Superman Series,” clocking in at just shy of 13 minutes, looks at the impact of these cartoons and how innovative they were. A host of historians and animators chime in on the concept of Superman and the history of these stunning cartoons. Both discs feature trailers for assorted Warner Home Video releases, with the first disc containing a ten minute featurette on the upcoming Green Lantern: First Flight direct-to-video animated feature. Menu screengrabs are available below. Overall, in terms of both the DVD release and the main feature, this is simply a great release. It’s a fantastic set providing the best possible edition of these cartoon shorts and some suitable bonus features. Warner Home Video has made a smart move by making these cartoons available in the first official release of these cartoons. Not only are these Superman shorts an important piece of history, both for animation fans and Superman fans, they’re also visually stunning and just flat-out enjoyable to watch. The Max Fleischer’s Superman: 1941-1942 DVD collection is definitely a Must Own release, one that belongs in everyone’s collection. I know that’s a tired statement, one that’s said over and over, but these animated shorts are a major part of history and, more importantly, an absolute joy to watch. 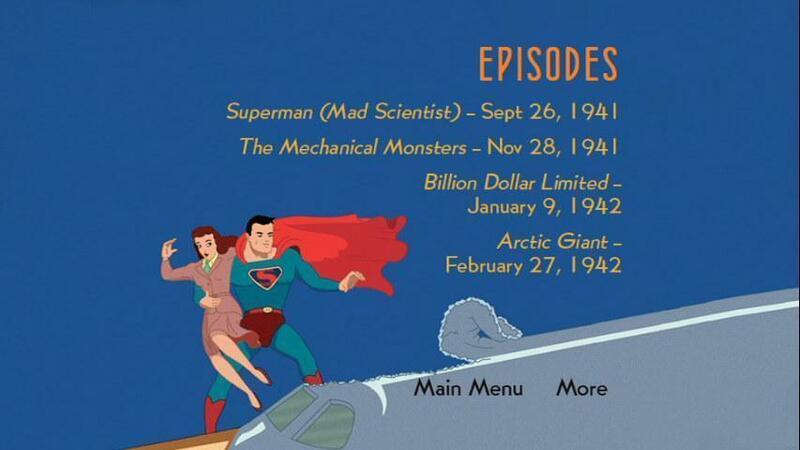 Max Fleischer’s Superman: 1941-1942 is now available to own on DVD.